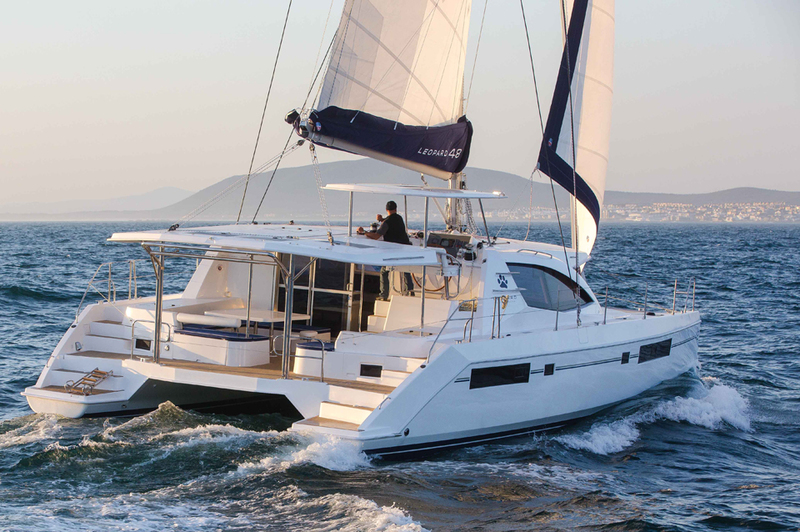 The Leopard 40 is the smallest in this fleet, but it’s a sailing catamaran with big boat features. With this latest design, the entire line was refreshed within the last five to six years. This newest baby of the family should allow the builder to do well both with private owners as well as with their charter partner, TUI Marine, the parent of The Moorings, Sunsail and Footloose. On deck, the Leopard 40 emulates its larger siblings. It capitalizes on the forward cockpit concept first introduced to Leopard by designer Gino Morrelli. 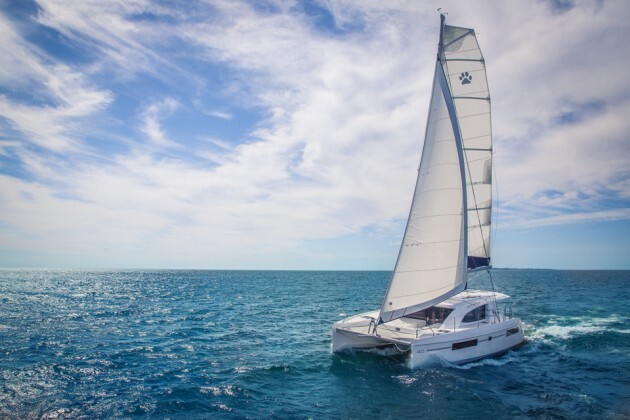 Judging from the exuberance of Franck Bauguil, Vice President of Yacht Ownership and Sales for TUI, this compact cat is expected to be a big hit with charterers as well as the owners who place their boats into charter programs. Almost the complete focus of this design is on unifying the gathering places aboard and creating a natural flow of traffic, fresh air and social activity. Leopard seems to have hit its mark, because this design packs a lot into just 40 feet. Designer Gino Morrelli rightly deduced that a second cockpit ahead of the cabin house is an ideal place to enjoy sundowner cocktails when the sun is baking the aft cockpit, as the boat lies to anchor in the trades, facing east. Due to its compact size, the 40 has a slightly different take on this concept in that there isn’t a dedicated cockpit—but a nice lounging area nonetheless. While it's not exactly a forward cockpit, the door to the forward deck does make a nice spot for cocktail hour. A door leads from the interior to the forward deck. Here, there are steps up to the trampoline so you don’t need to sprint around the sides to get to the anchor or windlass. To starboard is the “cocoon,” a pod that provides significant below decks stowage and even has room for the optional genset. Toss a few cushions onto this corner, neatly tucked up against the forward window, and you’ve got a comfy lounge or a “forward cockpit” of sorts. Because the expansive forward window does not open, this door is also the way to bring in lots of air and get good circulation for the interior. It’ll keep things cool even in the tropics. 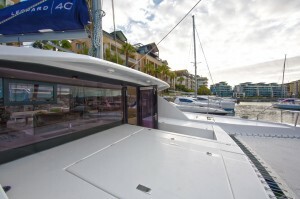 The helm is to starboard and is integrated into the cabin house. Everything including the engine gauges and throttles, compass, and Raymarine multifunction display are in position and presented at a good angle to the helmsman. A small counter in the middle, with a stainless bracket, is bound to gather personal items such as cell phones and sunglasses. There are even cup holders mounted to the side of the cabin top. One winch controls all the lines, which are led aft through eight neatly-aligned rope clutches. It’s an impressive display of organization, which caught my eye at the dock. On our test sail however, it proved to be a bit clumsy in that the sheet bin at knee-height below and halfway behind the wheel is just large enough to hold all the halyards and sheets, and only when neatly coiled. If hastily stuffed in while under way, they tend to snake out and create a bowl of spaghetti right at the control area, which can be inconvenient. Some sheet bags outboard might help with this. The helm is covered by a hardtop, which makes it look like a command pod. It’s very protected from the elements and is part of Leopard’s practical goal of eliminating all canvas that’s bound to need replacing periodically, especially in tropical sun. A cutout in the top provides a sliver of view of the sail overhead. The hardtop also makes a good handhold when climbing the two molded-in steps up to the cabin-top. You’ll need that handhold as the nonskid stops a ways from the cabin-top edge and the steps are angled. I’d be hard-pressed to use these steps with wet feet. There’s a matching set of steps to port but because there’s no hardtop to hang onto, there’s only a small handle attached to the horizontal cabin-top. Three steps lead from the helm down directly to the cockpit, which means the helmsman is within earshot of those who are enjoying the cruise here at the large dinette to port and lounge to starboard. This area will easily accommodate eight for dinner and another half dozen for cocktails. You may even be able to invite a few more over for wine and cheese because the outdoors flows into the indoors by way of the sliding door and window. The cockpit and inside dining settees are back to back, so two people can sit and face opposite directions but still carry on a conversation since they’re effectively sharing one space. Leopard moved the galley to starboard, which helps open up the main deck. A single sink, cook-top, oven, and quite a bit of countertop space dominate galley in the starboard quarter. Two-drawer refrigeration is a few steps aft near the large electrical panel. An odd feature is a tiny forward-facing desk that’s tucked in to port of the forward door. It’s too small to be called a nav station but with its seat, it provides a work area large enough for a laptop, away from those dining at the main table. Charging outlets for personal electronics are to be installed here soon. Our test boat was configured for private use, so the owner’s suite took up the entire starboard hull. The well-proportioned head is forward with a dedicated shower stall. A large berth is aft with plentiful stowage. In the middle is another much wider, more functional desk, with a built-in vanity. A couple would be very comfortable here, lacking nothing that a big cat offers. The port hull has two cabins and a shared head. 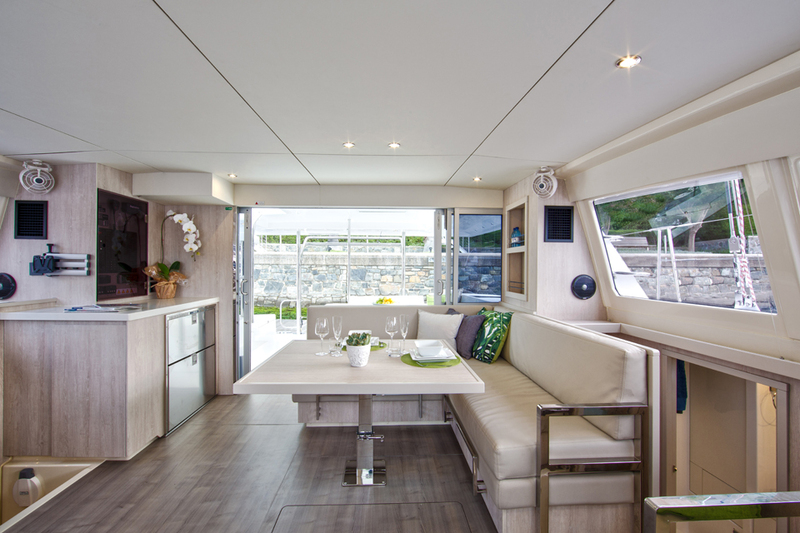 The aft cabin has an ample bed while the forward cabin will be cozy for two. 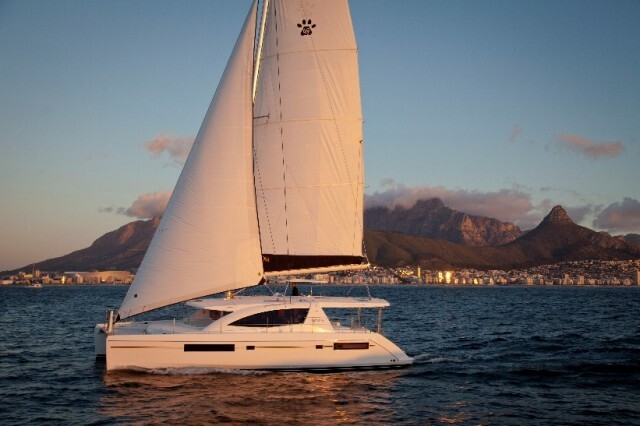 The charter version offers four cabins, two heads and even a sleeping berth in each bow. These will be ideal for crew or kids, but they’re simple bunk areas without heads. A bunch of us (14 in fact) were aboard for the test sail and it was surprising how well the boat managed to accommodate all those bodies without anyone feeling squeezed. We headed out onto Biscayne Bay in Miami but then took a turn to head out Government Cut. On our way we grounded—less a comment on the boat and more on operator error—so making the best of a bad situation, we decided to see how she would un-ground given all the weight aboard. We unstuck ourselves with a hard punch in reverse. The twin 29-hp Yanmar diesels with Saildrives churned up the water and with the wheel over to port, and we twisted ourselves right off the shoal and continued on our test under power. 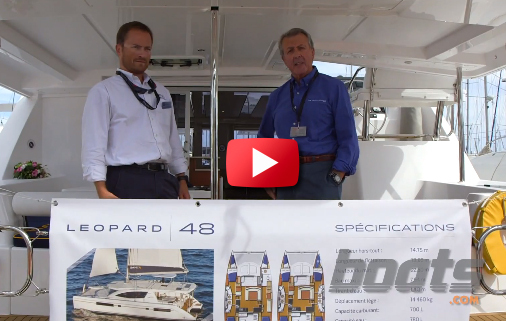 The Leopard 40 will cruise at seven knots and at wide-open throttle (3000 rpm), will motor at 8.4 knots on flat water. 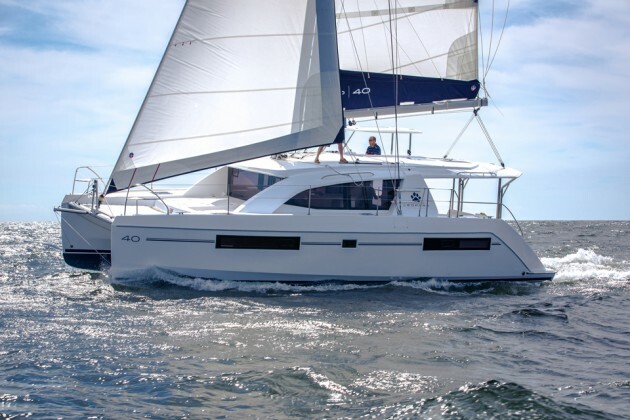 On the Leopard 40 you'll enjoy spirited sailing with a relatively simple rig, and room for a huge crew. We had spirited conditions outside the Cut with winds of 15 to 20 knots and building seas of four to five feet. In 16 knots of breeze at 70 degrees apparent wind angle, we slipped along at 8.3 knots, dropping to 5.9 knots with a wind angle of 120 degrees. There are lots of useful features on this catamaran including a solar panel array on the cabin top, lifelines that are actually high enough to do some good, dinghy davits that lower to the waterline to make clipping on the tender much easier, and a simple rig that’s ready to single-hand. Sail Area 1,032 sq. ft. I spend much of my time these days on large sailing cats and when I stepped aboard the Leopard 40, I almost forgot I was on a 40-footer. The functional spaces and amenities on this boat are nearly as plentiful and creative as on boats five and 10 feet longer. Because cats are nearly square platforms, only a few feet of extra length translates to an almost logarithmic difference in available deck and living area. 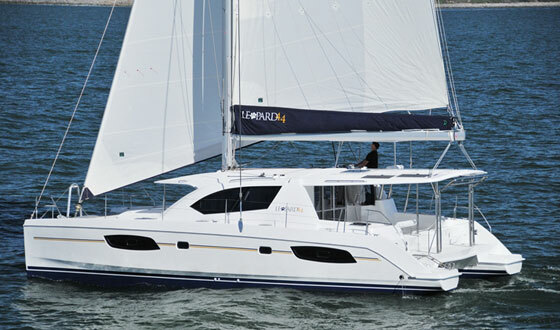 The Leopard 40 is missing very little in terms of comfort aboard, and its relatively sleek lines will get it noticed in any anchorage or marina. Finally, one of the best things about the Leopard 40 is the price. At a base of $349,000, it comes in over $100,000 less than it’s bigger sister, the Leopard 44. 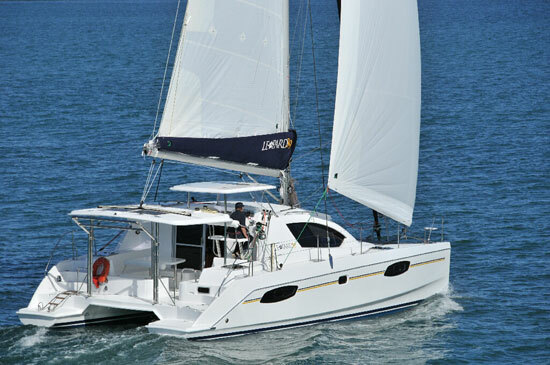 The sail-away price (with most everything but a genset) will add another $90,000 to that base—still a good value for a compact cat that lives up to its aspirations as a big kitty, ready to run. 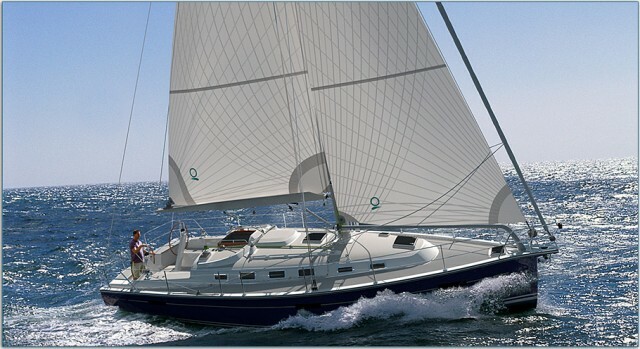 Other Choices: You will also want to see the Nautitech 40 Open. If a larger multihull sailboat is what you're looking for, the Lagoon 440 would be a good one to consider. 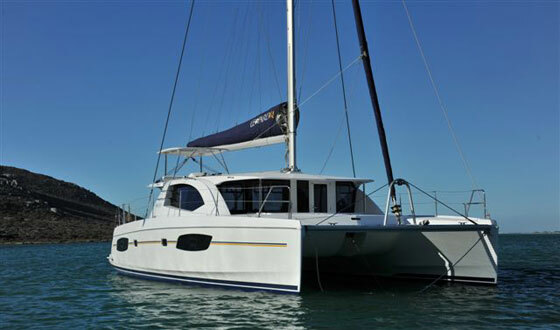 And if a multihull is a must-have but size and price are hurdles, check out the Gemini 35, now built by Catalina Yachts. For more information, visit Leopard.